I’m back with yet another gift guide! I’m super pumped for this one, because it’s very on-brand with the rest of my blog. 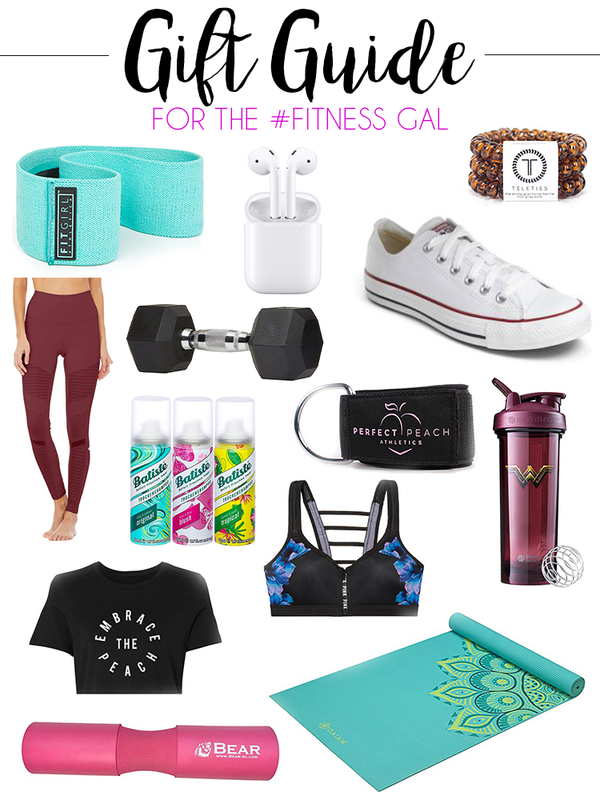 It’s full of fitness-y things like workout clothes, gym accessories, and a few splurge items for the gym goer in your life. Hip Circle | This same resistance band was on my Christmas wishlist last year, and it has gotten a ton of use in the past year. These resistance bands are a bit less stretchy than traditional ones, which means they add an extra level of challenge to leg exercises, and can also be used on their own as a warm-up for lifting heavier. I use mine basically every leg day! AirPods | Every person I know who doesn’t have AirPods is skeptical of them. Every person I know who has them loves them to death. The charging case is amazing because you don’t have to worry about your headphones dying on you all the time, and they stay in your ears regardless of what you’re doing. I alternate between big, bulky headphones and these guys – but honestly, AirPods are the winner because they’re good for cardio as well. Teleties | I’ve gotten super attached to Teleties, mainly because my hairstylist pointed out to me that regular hairties were ripping my hair out, which is… less than ideal. Especially for someone like me, who’s got her hair in a massive topknot 85% of the time. These are a much less aggressive alternative and make such a cute stocking stuffer! Converse | The best shoes for leg day. The logic behind them is this: the flatter soles allow you to distribute your weight more evenly across all parts of your feet, which makes sure that you’re not over-relying on one part of your leg muscle (like your quads) in compound movements like squats, which should be targeting your quads, hamstrings, and glutes all at once. Moto Leggings | These are adorable, and they’re on sale right now! This red color is really fun, but they’ve also got more staple colors like black, gray, and navy. Dumbbells | For the fitness gal who loves her home workouts, a set of dumbbells is a great gift (although admittedly, a very heavy one). There are all sorts of fancy colorful ones, but I personally really like the dumbbells with a metal grip in the middle. Dry Shampoo Set | An absolute gym bag necessity, and these cute little mini bottles are so easy to throw in your bag without taking up a ton of space. Plus, these smell so good, which is perfect for post-gym freshening up. Ankle Strap | This is one of those things that some gyms have, but even if they do, it’s almost always impossible to find. Having your own set makes things so much simpler, and saves you that five minutes of running around the gym trying to find that one dumb ankle strap that’s been thrown into some strange place and smells super weird. Sports Bra | The detailing on this is so fun! Victoria’s Secret sports bras are some of my favorites, because they’re way more supportive than most, and tend to go on sale pretty regularly (like right now, for example – this one’s $25!). BlenderBottle | Because who doesn’t want to channel their inner Wonder Woman at the gym? This bottle is super cute and sleek, and this brand is by far the best when it comes to mixer bottles. (If you didn’t know, the little blender ball helps break up clumps when you mix in protein powder – it’s a lifesaver, truly.) There’s also a Harry Potter line, but I figured I wouldn’t include that one given that the last guide was exclusively HP-themed. Peach Tee | Honestly, I just find this shirt hilarious. It’s available in both full-length and cropped, depending on what your gift recipient’s gym style is – and they’ve got a whole collection of other tees with snarky sayings, if this one isn’t your fave. Barbell Pad | Yet another thing that constantly gets lost in the abyss of a gym. For the girl who takes leg day and hip thrusts very seriously, this is a perfect addition to her gym bag. Yoga Mat | Okay, so first of all, the colors on this yoga mat are so pretty and so calming – I’m feeling zen just looking at them. This one’s perfect for the yogi in your life, or even just the girl who likes doing her workouts in the comfort of her own home.